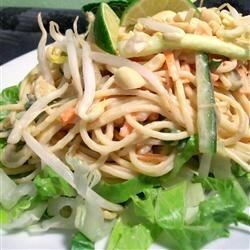 "This is a delicious and flavorful salad. Udon noodles can be purchased at health food stores, Asian food stores and at most supermarkets." Thai flavors elevate this salad into a meal! the presentation of this salad is very nice! i think next time i would try another type of noodle...the udon noodles were a little too floury and bland for our taste. We didn't really like the taste of the peanut butter dressing.